So I’m having a moment with Thai food right now. I love it, you guys. We have a Thai restaurant near us that we have abandoned all of our other old favorites for, and now that I’ve learned that I can make it at home I’m pretty sure it’s going to be making a fairly regular (and by that I mean weekly.) appearance on our table. But first you should really hear the story of how I learned to make it, because it’s a pretty cool one. So it all started almost a year ago when I received a very nice comment here on the blog from this lovely lady. Of course I ran right over to her blog to check her out and proceeded to spend the rest of the night rummaging through her archives and commenting back and forth with her on almost every post, while she did much the same on my page. This continued for several weeks until she mysteriously disappeared from the internet (side note: you should all run over to her site and blow it up so she’ll come back and start writing again. Go on. Do it.) at which point I sent her an email to say hello and see what was holding up our comment chat. She emailed back, I replied, she replied… you see where this is going? So we discovered that we have quite a bit in common, and in fact our husbands are pretty much carbon copies of one another. We kept up our email correspondence, then moved on to texting, a phone call, and finally, we got to meet in person (!!!). We live quite a long ways from one another so it was pretty much the coolest news I received all year when I heard that they were headed to Georgia for a vacation. We met in the North Georgia mountains and spent a lovely relaxing weekend cooking, eating, talking, and wandering around looking at scenery. It was pretty exciting to have made such good friends from something so small as a comment on a blog, and it reminds me how small all this technology has made the world these days. So what does this have to do with curry? Well, Eve was very kind and did some shopping for me since she lives near one of the coolest cities in the world and can find all sorts of ethnic goodies that I just don’t have access to out here in the boonies. She brought me fish sauce, sesame seed oil, several varieties of curry paste, crab paste, shrimp paste, some lovely noodles, lemongrass… all sorts of things. 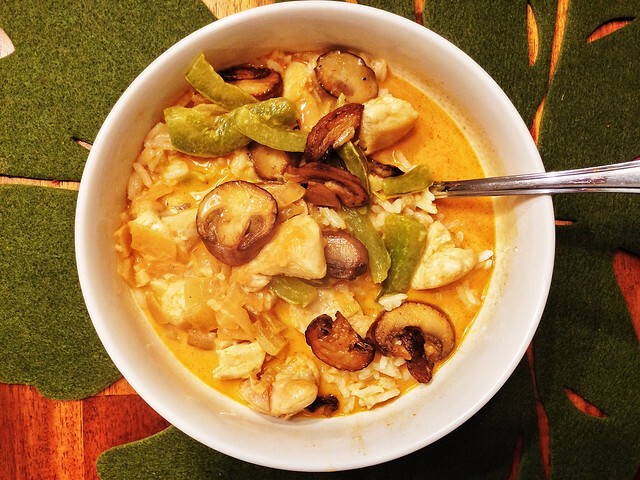 And she showed me her method for this delicious Thai Coconut Curry. The best thing about it (besides being yummy-scrumptious, I mean) is that it’s basically a one pot meal. I use my 6-quart Lodge pot, and besides that you just need a pot for rice, a cutting board, a good knife, and a spoon. That’s not even a quarter of a dishwasher load. Or a half of a sink-full of dishes. Or whatever. My sink is pretty small, so if it all fits in one side then I consider that a victory over the dirty-dishes devils. The point is that you can make restaurant quality Thai food in your own kitchen in under an hour, and with only like 7 ½ dishes to wash. Or whatever. The recipe is sort of made up – for the curry paste and fish sauce you just taste as you go. I’ll tell you approximately what I used, but I’d recommend that you start with less than that and work up to whatever level you’re comfortable with. And I know that fish sauce is intimidating to a lot of people – I mean, it does smell sort of funky, and it can have a pretty strong flavor if you’re not careful, but please please please give it a try. It won’t be the same without it. Also, I give instruction to brown the chicken and mushrooms separately and set aside before cooking the veggies and adding the liquid. You could just dump all the ingredients in the pot – chicken, veggies, mushrooms, liquids, etc – and cook it all together that way. It would probably go a little quicker if you’re short of time, but if you’re not then I definitely recommend browning your meat and ‘shrooms first. Anytime you caramelize something, you’re concentrating the flavor and making it a little deeper, a little more intense. That’s never a bad thing in my book, and it only adds about 15 or 20 minutes at most to the cooking time. Heat a little olive oil in a large heavy pot (like this one) over medium-high heat. Brown chicken in batches, turning once, until browned on both sides. Set aside. Brown mushrooms in batches, turning once, until browned on both sides. Set aside. Add onions and peppers to pan and cook until onions are starting to turn golden, 6-7 minutes, stirring occasionally. Add garlic and cook another minute or two until garlic is golden and fragrant. Add the can of coconut milk and chicken stock and stir to combine. Add the curry paste and fish sauce, tasting as you go. Add the mushrooms and chicken back to the pot, along with any juices they’ve lost, and allow mixture to simmer for a few moments so that everything is nice and hot. Garnish with fresh basil. Serve over rice and enjoy! *I just fill my empty coconut milk can with stock and add that, plus a little more. The curry will look soupy. ** I like curry and fish sauce so I feel like we added around 4 tbsp of each. I really just scoop a little curry paste in, add a glug of fish sauce, taste, and repeat. When it tastes good, I stop adding. I realize that’s not very precise, but taste is very personal you know? Do what you like. Same goes for the garlic.